Pennsylvania wants to make hay out of its historic barns. The state House and Senate recently passed a resolution to take inventory of Pennsylvania’s historic barns and to use the list to promote agriculture and tourism. 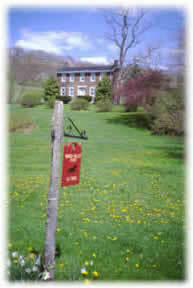 The inventory, conducted by the state Department of Agriculture and the Pennsylvania Historical and Museum Commission, is due November 2006. “There are 22,000 farms in western Pennsylvania in 33 counties,” said Lu Donnelly, project coordinator for an upcoming exhibit on barns at the Carnegie Museum in Pittsburgh. “Many of these farms have more than one barn, yet many of the barns are falling down. “Pennsylvania is quickly losing its rural heritage. Barns are very important and I’m glad the Legislature is aware of them,” Donnelly said. The inventory was sparked by the Center for Rural Pennsylvania in Harrisburg, a legislative research agency of the General Assembly. “Pennsylvania has a rich agricultural heritage and barns have been a mainstay in the state’s agriculture industry,” said Jonathan Johnson, senior policy analyst for the center. Researchers will start with farms listed with the state’s Century and Bicentennial Farms Program, which recognizes families who have been farming the same land for 100 or 200 years. The Albert and Nancy Lee Shetler farm, located outside of Greensburg, is the only Westmoreland County farm to receive the bicentennial farm award since the program was implemented last year. The Shetlers’ original log barn burned down and the family built a new one in 1909. It was one of the first barns in the county built with trusses. The legislators’ resolution did not determine what constitutes a historic barn, Johnson said. According to criteria set by the Pittsburgh History and Landmarks Foundation’s Historic Farm Preservation Program, a historic barn must be at least 50 years old, said Jack Miller, director of gift planning. “The barn should have significant architecture or architectural style,” Miller said. A major grant from a local foundation helped the organization to preserve five farms throughout Western Pennsylvania with historic buildings and more than 1,300 acres of farmland since the program started in 2000. Miller said his role is to show farm owners how planned gifts can be beneficial in saving farmlands. Liberta and Richard H. McConnell have lived on their Buffalo Township, Butler County farm since 1939. The couple purchased the farm from her parents, Daniel and Pauline Zeloyle. The L.B. Roenigk Farm in Buffalo Township, Butler County, also has a 110-year-old barn. Most of the old barns in Pennsylvania are known as bank barns, said Gary Shepard, director of the Penn State Cooperative Extension in Westmoreland County. “These historic barns were designed as closed structures. They were very efficient at the time and worked for a small number of animals. They’re beautiful old buildings but in light of modern technology, they don’t fit in,” Shepard said. Bank barns were built into a mound of earth or an artificially created bank. Historic barns were considered near extinction in 1987 when the National Trust for Historic Preservation and Successful Farming magazine launched Barn Again, a national program to preserve historic farm buildings. Barn Again has shown how historic barns can be adapted for new farming uses and ways in which preservation techniques are more cost-effective to tearing down and rebuilding. Scott Branthoover’s bank barn in West Newton was built around 1904 or 1907 and has been in his family since 1945 when his grandfather purchased the farm. Much of his farm’s infrastructure is built around the barn. One of the most visible farms along Route 30 in Westmoreland County is the Clair Frye farm in Unity Township. “The house is about 200 years old. I don’t know exactly how old the barn is, but I think it’s well over 100 years old,” said Lois Frye. She and her husband, the late Clair Frye, purchased the farm in 1954 from Martha Kuhns. Frye’s son, Wayne, now runs the farm. He said there is an underground cave with a spring that runs down the hill to the barn. “There used to be a watering trough for travelers along old Route 30,” said Wayne Frye, of the road that runs directly through the farm. The Carnegie Museum of Art is also harvesting the revived interest in barns. It will sponsor a special exhibit, “Barns of Western Pennsylvania: Vernacular to Spectacular,” beginning in February. The state Historical and Museum Commission has been working on farmland preservation issues with the agriculture department for some time, said Jane Crawford, press secretary for the commission. Jack Miller remembers well the day in 2000 when he met Lucille Tooke on her family farm in Pine. “Talk about pressure,” said Miller, director of gift planning for the Pittsburgh History & Landmarks Foundation. His mission — to find some way the nonprofit preservationist organization could help Tooke preserve her farm, and save it from ending up as part of either another new housing development or a commercial project in the fast-growing suburban North Hills. Starting with Tooke’s farm, the Landmarks Foundation has used novel financing strategies as part of its Historic Farm Preservation Program to save five historic farms in Allegheny and Westmoreland counties, encompassing some 1,300 acres of property and 10 different farm structures. It did so with the help of a $500,000 grant from Richard King Mellon Foundation, which the foundation matched with an additional $600,000. Using bargain sales and sometimes complicated gift strategies, the Landmarks Foundation has been able to leverage that $1.1 million to protect structures and land with an estimated value of about $6 million, said Arthur P. Ziegler Jr., head of the organization since its inception 40 years ago. “Some of these historic farms that can show how people lived 100 or 200 years ago need to be preserved,” Miller said. That doesn’t mean economic development has be stopped in the process. “They can be developed around rather than developed on,” Miller said. Nine are in Allegheny County and one is in Washington County. In addition, it has had inquiries about other farms in Butler, Fayette and Westmoreland counties. If the organization had another $1 million, it could save another 2,000 acres and five of those properties, Miller believes. Landmarks has approached other foundations in hopes of raising more funds, Ziegler said. In addition, Miller said the foundation is hoping to work with others dedicated to preserving farm properties, including the Allegheny County Agricultural Land Preservation Program, in an effort to attract more private support. The farm preservation program got its start when Tooke donated her 64-acre Hidden Valley Farm on Old State Road. 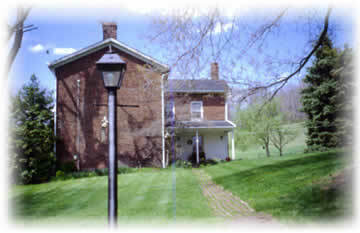 It features a farmhouse built in 1835 that was awarded an historic landmark plaque in 1979. “She (Tooke) wanted to see if there was a way she should get the funds she needed to retire without having to prostitute the farm,” Miller said. At his suggestion, Tooke agreed to establish what is known as a charitable remainder unitrust, or CRUT. With this form of gift, a donor transfers cash, securities or other properties to the trust, and in the process avoids capital gains tax, receives a federal income tax deduction, and a percentage of the trust’s value in income annually over a set period. Because federal tax laws required the trustee to entertain bids to assure the highest price for the assets, Tooke could not just give the farm to the foundation outright. But she was legally permitted to specify that any organization willing to preserve the property would have the right to match the highest offer. Thus, Landmarks ended up as the highest bidder, paying about $580,000 to purchase the property. The foundation then placed preservation easement on the farmhouse and the land to prevent any nonagricultural development. Tooke was able to retire in Chambersburg, Franklin County, with a revenue stream that will last a total of 20 years. Her three daughters will receive the payouts if she dies before that period expires. That turned out to be William Versaw, of Fox Chapel, who is also interested in preservation. “I have five children and wanted to find a place we could use and enjoy close to home,” said Versaw, who has restored the historic farmhouse and enjoys gathering apples on the property for apple pies. Versaw purchased the property for about $400,000, and he gave the foundation an additional $10,000 to endow the preservation easement. The funds cover Landmarks’ expense in monitoring the property annually. “We lost about $200,000 on the deal, but we should get that back from the funds that remain in the trust at the end of the 20-year period,” Miller said. That is because Tooke made the foundation the irrevocable beneficiary of her trust. The foundation found other methods to preserve other farm properties. One example is the O-Shea-Hausen farm in Donegal, Westmoreland County, a property owned by two priests, Jeremiah O’Shea and C. William Hausen, which traces its roots back to the early 1800s. Landmarks helped the owners pay off a mortgage (about $50,000) on the 62-acre site, generate some additional income for their retirement through a charitable gift annuity and provide $10,000 to endow the monitoring costs for a preservation easement. The foundation will get back the gift portion of the annuity when the donors die. O’Shea said he and Hausen purchased the Geary farm in 1992. It contained a barn that dated back to the 1890s, which was built by the Geary family, and a log cabin, which dates to the mid-1800s. O’Shea said he contacted Landmarks after getting information about its program from American Farmland Trust. In another case, Landmarks assumed a mortgage on a farmhouse owned by James and Dorothy Wycoff, descendants of the original owners of the Van Kirk Farm in Elizabeth in order to obtain a preservation easement. Horses used in the Lewis & Clark Expedition once were boarded on the 71-acre farm property. It also saved two other properties in Elizabeth, one a 214-acre farm off Park Avenue owned by the estate of Helen R. Wycoff by negotiating a preservation easement. The other property was an adjoining 54-acre parcel off Rothey Drive. The organization purchased the property at fair market value and conveyed it to owner of the Wycoff farm, who accepted the land as payment for an easement. In the case of preserving an historic farm property, “You don’t have to give it away and lose it; you can give it away and keep it,” he said. Ron DaParma can be reached at rdaparma@tribweb.com or 412-320-7907. The Pittsburgh History & Landmarks Foundation (“Landmarks”) in Pennsylvania merged preservation and planned giving in one innovative transaction that began in 2001 with the creation of a charitable remainder unitrust (CRUT) that named Landmarks as its sole, irrevocable beneficiary. Tooke and her husband, Jack, had bought the 64 acre farm in 1954. After her three daughters moved away and her husband died, it became increasingly difficult for Tooke to care for the farm, so she approached Landmarks to see if they knew of anyone interested in buying and preserving the property. Landmarks helped Tooke work out a plan wherein she gave the farm to a CRUT, received a charitable deduction for a portion of the property’s value, and now receives a percentage of the trust’s value each year until 2021. When the trust put the farm up for sale, Landmarks was able to match the highest bid and buy the farm, creating the cash needed to generate Tooke’s income payments. Landmarks added deed restrictions that require future owners to get prior approval from the organization before altering the house’s exterior. They also stipulated that the land cannot be subdivided or used for non-agricultural commercial purposes. They then sold it with the security of knowing it will be protected in perpetuity. The arrangement provided Tooke with needed retirement income and when her payments end in 2021, Landmarks receives the trust balance as a gift to its endowment program. South Fayette officials want to take a decidedly careful approach to residential growth, saying they are well aware of what indiscriminate development can do to suburban farms and woodlands. That was evident at a special meeting recently about the old Boys Home property, a 214-acre farm off Battle Ridge Road near Oakdale that the township owns. The 50 residents and officials of South Fayette indicated a strong preference for preserving most, if not all, of the land. The Smiths’ comments were representative of most residents, although a few found much appeal in the idea of the township selling a portion of the property to pay for improvements to the Boys Home gymnasium. The building is sound structurally, but a major renovation would be required for it to serve as a community athletic or meeting center. Commissioner Sue Caffrey, who serves on the board of the South Fayette Conservation Group, said she had no preconceived notions about what to do with the property overall. But as for the gymnasium, she hopes it can be renovated. Selling a portion of the property to pay for it is an option. Residents were encouraged by Pittsburgh History & Landmarks Foundation President Arthur Ziegler to mail additional comments to the township by Sunday. By Feb. 19, township and foundation officials will put together a proposed plan. They have hired the consulting firm of LaQuatra Bonci Associates to, among other things, compile a natural resources inventory of the Boys Home property. With this information, the company prepared several maps outlining how the property could be developed in conservation-friendly ways to accommodate a limited number of homes. Several of the maps featured small clusters of small-lot homes with the majority of the property remaining open space. Others featured nonclustered homes on larger lots, the idea being that the property could be developed to a large extent but preserved to open space via easements. Joe Hackett, of LaQuatra Bonci, said that in the township’s current zoning ordinance, land preservation was not a consideration. Were the township to sell the Boys Home property, he said, a developer could turn it into something that looks like one of the many “cookie-cutter” housing plans that have sprung up. Caffrey said the township was updating the zoning ordinance to, among other things, put an end to tree-clearing residential development. Although many municipal zoning ordinances impose requirements for open space preservation, it is most generally the least desirable and least “developable” part of a property ? steep slopes, for example ? which developers will “dedicate” to open space, Bonci said. Ziegler and Bonci emphasized that, elsewhere, developers were beginning to realize that homeowners like having higher value open space bordering their properties. The meeting was the second in a series to let residents express their preference for how the Boys Home property should be handled. The next meeting will be Feb. 19 in the conference center in the South Fayette Township High School. Some years ago, the state of Maryland provided about $12 million for a new road to help facilitate development of the Country Club Mall, a regional shopping complex built on a parcel of undeveloped land outside of the community of Cumberland. About two years later, many of the smaller stores in downtown Cumberland had been closed, and ever since, public officials have been putting in money to revitalize the city’s business district. “If you go throughout just about every state in the union and map development, you will find exactly the same type of patterns,” said Glendening, who was a keynote speaker in Oakland Friday at a symposium whose main focus was finding ways to deal with the growing problem of having thousands of abandoned buildings in Pittsburgh and other older communities. The topic was important enough to draw about 300 community leaders, public policy activists, development experts and others to the Soldiers & Sailors Memorial Hall at the invitation of the Pittsburgh History & Landmarks Foundation, which was host and one of the cosponsors of the day-long event. One of the foundation’s primary concerns is to prevent the unnecessary demolition of vacant buildings that may still be viable assets to the community, said Arthur P. Ziegler Jr., president of the preservationist organization. The issue includes determining which structures are valuable and which are not. The problem is fairly typical in cities across the country, said Glendening, who is now president of the Smart Growth America/Smart Growth Leadership Institute. In Maryland, for example, he said there are about 40,000 empty dwelling units within the borders of the city of Baltimore alone. Government entities are spending hundreds of billions of dollars every year for new roads, new water and sewer lines and new schools to accommodate urban sprawl, Glendening said. But at the same time, they find themselves having to spend hundreds of millions of dollars to deal with social problems in the urban communities developers and businesses have left behind. One answer is to follow development and tax polices that will help prevent abandonment of even more buildings in the first place, Glendening said. That is why his organization is working with local and state governments across the nation to identify policies that work to redirect economic energy to existing communities and prevent sprawl. “What we have found is that many of the current administrative and zoning structures and actually the tax structure can actually discourage investment in existing communities and encourages people to go out and pave over one more farm or plough down one more forest,” he said. South Fayette wants to be extra careful as one of the few Allegheny County municipalities retaining a largely rural character to balance the pros and cons of economic growth. It is pushing for industrial and commercial development via a tax-exemption strategy. But it also plans to contract with a historical preservation organization to ensure that a tract of farmland owned by the township doesn’t become just another large, cookie-cutter housing subdivision. The prime property in question is the old Boys Home near Oakdale, and Commissioner Sue Caffrey is leading the preservation charge. Although conservation-minded (she’s a member of the South Fayette Conservation Group and the Allegheny County Farmland Preservation Board), she is not slamming the door on the idea that part of the 214-acre tract could be devoted to residential development. South Fayette will work with the Pittsburgh History and Landmarks Foundation to reconcile the competing forces of conservation and economic development. The township will have ultimate say in what happens to the property, with the foundation providing expertise to help township commissioners make informed decisions. Most of the tract is leased by the township for farming, Caffrey said. Portions have been farmed at least since 1899, when it became an orphan asylum. Within a year, it became the Boys Industrial Home of Western Pennsylvania under the Rev. John McCleland serving troubled boys with discipline or crime-related problems. By 1905, the Boys Home site encompassed almost 400 acres. Schooled on-site, the youths farmed the land and raised chicken and livestock. A gym was built at an undetermined time and has interesting architecture worth saving, foundation president Arthur Ziegler said. Although the gym needs major repair, Caffery said the foundation hopes to find a new use for the building. The Boy’s Home was closed by the state Department of Welfare in 1972, and the property was acquired by the Wesley Institute in 1980. As far as Caffrey can verify, that organization sold the property to South Fayette in 1987 at a cost of $725,000 for 321 acres. Between 1987 and the early 1990s, the township sold several parcels for residential housing and some land to adjoining homeowners. Caffrey sent letters last year to several regional and national preservation groups to gauge their willingness to help with site planning. The Pittsburgh History and Landmarks Foundation indicated interest. The foundation will cover half of the project cost, the township the other half. The first order of business is to assemble an advisory committee with representatives from the township, South Fayette School District and the foundation. Ziegler said he hoped to have the committee formed within a month. Patrick Ponticell is a freelance writer. Pittsburgh, Pa. . . . .
On December 11th, 40 farmers attended a meeting at Hidden Valley Farm arranged by the Pittsburgh History & Landmarks Foundation to discuss new and creative tools now available to help preserve Allegheny County farms. One of those tools included Landmarks’ Historic Rural Preservation Program, which offers a variety of planned gifts that help farmers reduce income, estate and property taxes, while preserving historic farm property. Also presenting were representatives of the Pennsylvania Department of Agriculture, Allegheny County Conservation District and Allegheny Land Trust. They discussed how development, scenic and conservation easements could be used to provide cash and reduce real estate assessments for farmers being threatened by increasing development and urban sprawl. Landmarks held the meeting at Hidden Valley Farm to show how an historic farm can be preserved without having a negative financial impact on the owner. The 64-acre 1835 farm was gifted to a charitable remainder trust and eventually purchased by Landmarks. In return, the donor received significant tax benefits and a 20-year income stream. At the end of that time, Landmarks receives whatever remains in the trust, an amount expected to offset the loss Landmarks’ experienced after making protective façade and scenic easements a condition of its resale. Now that these farmers know that they have choices, the next step is to meet with them individually to discuss their interests and needs. Though this collaborative effort, it will now be possible to match a variety of preservation tools to meet the specific needs of the individual farmers. We recently announced a rural preservation program and acquisition of Hidden Valley farm located in the Mars-Gibsonia area of the county by purchase from a charitable remainder trust established by Lucille Tooke to benefit Landmarks. 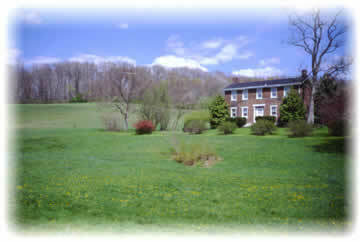 Recently, we completed the sale of the property to a private owner after he agreed to place protective easements on both the 1835 brick farmhouse and the 64 acres of beautiful western Pennsylvania hillside farm. The buyer plans to restore the front porch and rebuild a barn similar to the original that was destroyed by a fire more than a decade ago. The area is rapidly developing both residentially and commercially. The Treesdale Farms development is nearby as is sprawling Cranberry Township. The proceeds of the sale will be allocated to further historic farm preservation. We are now trying to raise considerable funds to enlarge this program so that we can acquire other historic farms in Allegheny County.